The Dark Side is the U.K.'s magazine of the macabre, covering and reviewing horror films around the world. 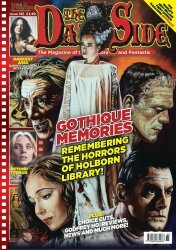 This is issue #185 - Gothique Memories, Remembering the Horrors of Holborn Library. Gothique Memories, Remembering the Horrors of Holborn Library. Darkest Asia, Dario's Daughter Interviewed. Beyond Terror, It's the Fulci Monty! Plus, Choice Cuts, Godrey HO, Reviews, News and Much More! Missed Issue #184? Use the convenient Buy Both button below!